VALENCIA, SPAIN — Berklee College of Music launched its first master’s degree program on Monday far from Massachusetts Avenue — in sunny Spain, to be exact, cradle of Flamenco fusion and a crossroads of Latin American, European, and North African sounds. The program has attracted 75 students from 29 countries to an avant-garde campus in Valencia, a city better known for its paella and beaches than its brass section, but one that is home to 40,000 musicians and a strong symphonic band tradition. “The music here is in the air,” said Latin jazz artist Victor Mendoza, director of performance for Berklee Valencia. Berklee master’s students will perform, compose and study music management in Valencia’s landmark Palau de les Arts Reina Sofia, a ceramic-clad opera house built by the Gaudí-inspired Spanish architect Santiago Calatrava. Berklee spent $8 million to restructure a 3,600-square-meter annex adjoining the Palau and outfit it with state-of-the-art recording studios, production suites, rehearsal rooms and technical labs for film and video scoring. The college has also recruited faculty and visiting artists from around the world, including Cuban bassist Alain Pérez, Argentine drummer Mariano Steimberg and Moroccan violinist Faiçal Kourrich. Many of the musicians hail from Spain itself, including singer-songwriter Soledad Giménez and Flamenco guitarist Antonio Sánchez, who performed in April at the Boston Opera House with Flamenco fusion icon Paco de Lucía. Part of that inspiration comes from the campus itself. The opera house looks like a sleek white ship glistening amid turquoise reflecting pools. 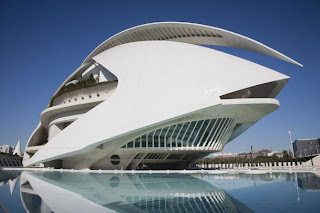 It sits at one end of Calatrava’s space-age City of Arts and Sciences, which contains a science museum that resembles a dinosaur skeleton and an IMAX theatre in the shape of an eyeball.